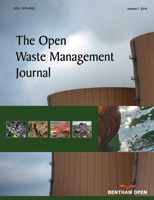 The Open Waste Management Journal is an Open Access online journal, which publishes Research articles, Reviews and Letters in the field of waste management, aiming at providing the most complete and reliable source of information on current developments in the field. For obtaining permission for reproducing any material published in an article by Bentham OPEN, please fill in the request FORM and send to towmj@benthamopen.net for consideration. This journal publishes open access reviews on recently published books (both print and electronic) relevant to the journal. Publishers and authors of books are invited to contact our book reviews editor at to towmj@benthamopen.net with book review requests. All submitted books will be reviewed by an independent expert in the field. No page charges will be levied to authors for the publication of book reviews. The journal also considers Supplements /Thematic issues for publication. The Guest Edited Thematic Issues are published free of charge. A Supplement/Thematic issues will be a collection of articles (minimum of 6, maximum of 20 articles) based on a contemporary theme or topic of great importance to the field. Mini-supplements consisting of between 3 to 5 articles are also welcome. A Supplement can consist of either all review articles or a mixture of review and research articles. The Guest Editors' main editorial task is to invite the contributors to the Supplement and to manage the peer review of submitted manuscripts. A short summary or proposal for editing a supplement should be submitted to the Editor-in-Chief at e-mail to towmj@benthamopen.net with a copy to specialissue@benthamopen.net. The main text should begin on a separate page and should be divided into separate sections. The text may be subdivided further according to the areas to be discussed, which should be followed by the List of Abbreviations (if any), Conflict of Interest, Acknowledgements and Reference sections. For Review and Letter articles, the manuscript should be divided into title page, abstract and the main text. The review article should mention any previous important reviews in the field and contain a comprehensive discussion starting with the general background of the field. It should then go on to discuss the salient features of recent developments. The authors should avoid presenting material which has already been published in a previous review. The authors are advised to present and discuss their observations in brief. For Research articles, the preparation of the main text must be structured into separate sections as Introduction, Materials and Methodology, Results, Discussion and Conclusion. The manuscript style must be uniform throughout the text and 10 pt Times New Roman font should be used. The full term for an abbreviation should precede its first appearance in the text unless it is a standard unit of measurement. The reference numbers should be given in square brackets in the text. For heterogeneous catalysis, presentation should include reaction rates normalized by catalyst surface area, surface area of the active phase, or number of active surface atoms or catalytic sites, as appropriate. Typical rate units are mol s-1 m-2 or, in the case of surface atom normalization to produce turnover frequencies, s-1. For homogeneous catalysis, rates should typically be reported as turnover frequencies. Comparisons of selectivities should be made at similar conversions. Catalytic measurements need to be carried out under kinetically limited conditions. Confirming tests need to be carried out and reported, especially for all reactions occurring in the liquid phase. Greek symbols and special characters often undergo formatting changes and get corrupted or lost during preparation of a manuscript for publication. To ensure that all special characters used are embedded in the text, these special characters should be inserted as a symbol but should not be a result of any format styling (Symbol font face) otherwise they will be lost during conversion to PDF/XML. Only ISO symbols, written in italic, should be used for the various parameters. All kinds of measurements should be reported only in International System of Units (SI). SI units should always be written in roman and separated from the numerical value by a space (whatever the language). The µ in µg or µm should be in roman. The symbol for liter is L and that for minute is min. For temperatures, please note the use of °C and °F but K. As the Ångström (1 Å = 10-10 m) is not an SI unit, it should be replaced by the nanometer (1 nm = 10-9 m) or by the picometer (1 pm = 10-12 m): 1 Å = 0.1 nm = 100 pm. Multiple units should be written with negative superscripts (for example, 25 mguL-1 us-1). The list of notations should appear just before the first paragraph of full text. Avoid the use of built-up fractions in the text. If not avoided by the author(s), built-up fractions will be converted to equivalent expressions on the line when the paper is copyedited. In display matter, however, built-up fractions are preferred for clarity. Avoid the use of small-type mathematical expressions centered above or below arrows. If possible, try to use an alternative format. In the exponential function, avoid exponents having more than one or two characters. Avoid the use of reference numbers for equations that are not subsequently referred to in the paper. Costs are reduced if short mathematical equations and other expressions in the text are run in (instead of each being displayed on a separate line). Authors must expect that, when accepted papers are copyedited, "excess" equation reference numbers will be deleted and short equations will be run in with text. Be sure to indicate special marking for symbols (e.g., italics, boldface) and clearly identify any unusual symbols. Try to avoid underscored symbols because they often require hand composition and opening up lines and thus are expensive. In vector notations, indicate which letters or notations, if any, may be set in boldface type. Indicate if asterisks are to be set in superscript position or centered on the line. Equation number should be right justified. Put three dots(...) midway between the end of the equation and the equation number. Punctuation should not be used at the end of an equation. Authors should provide the equations in *TeX/LaTeX file format separately as well as embedded in the manuscript. Nomenclature should conform to current American usage. Insofar as possible, authors should use systematic names similar to those used by Chemical Abstracts Service or IUPAC. Chemical Abstracts (CA) nomenclature rules are described in Appendix IV of the Chemical Abstracts Index Guide. Authors are encouraged to call attention to safety considerations such as explosive tendencies, special precautionary handling procedures, toxicity, and special waste disposal procedures. References must be listed in IEEE style only. All references should be numbered sequentially [in square brackets] in the text and listed in the same numerical order in the reference section. The reference numbers must be finalized and the bibliography must be fully formatted before submission. The author will be responsible for the accuracy and completeness of the references. N. Osifchin and G. Vau, "Power considerations for the modernization of telecommunications in Central and Eastern European and former Soviet Union (CCE/FSU) countries," in Second International Telecommunication Energy Special Conference Special Conference, 1997, pp. 9-16. K. Kimura and A. Lipeles, "Fuzzy controller component", U. S. Patent 14,860,040, December 14, 1996. L. Bass, P. Clements, and R. Kazman. Software Architecture in Practice, 2nd ed. Reading, MA: Addison Wesley, 2003. [E-book] Available: Safari e-book. P. H. C. Eilers and J. J. Goeman, "Enhancing scatterplots with smoothed densities", Bioinformatics, vol. 20, no. 5, pp. 623-628, March 2004. [Online]. Available: http://www.oxfordjournals.org [Accessed Sept. 18, 2004]. Journal titles should conform to the IEEE Transactions, Journals and Letters abbreviations. All authors must strictly follow the guidelines below for preparing illustrations for publication in The Open Waste Management Journal. If the figures are found to be sub-standard, then the manuscripts will be rejected. The author will be required to provide their full names, the institutional affiliations and the location, with an asterisk in front of the name of the principal/corresponding author. The corresponding author(s) should be designated and their complete address, business telephone and fax numbers and e-mail address must be stated to receive correspondence and galley proofs. Also it is suggested to regularly update the profile on SCOPUS and other databases.